The link to Eventbrite is where you can purchase tickets at! 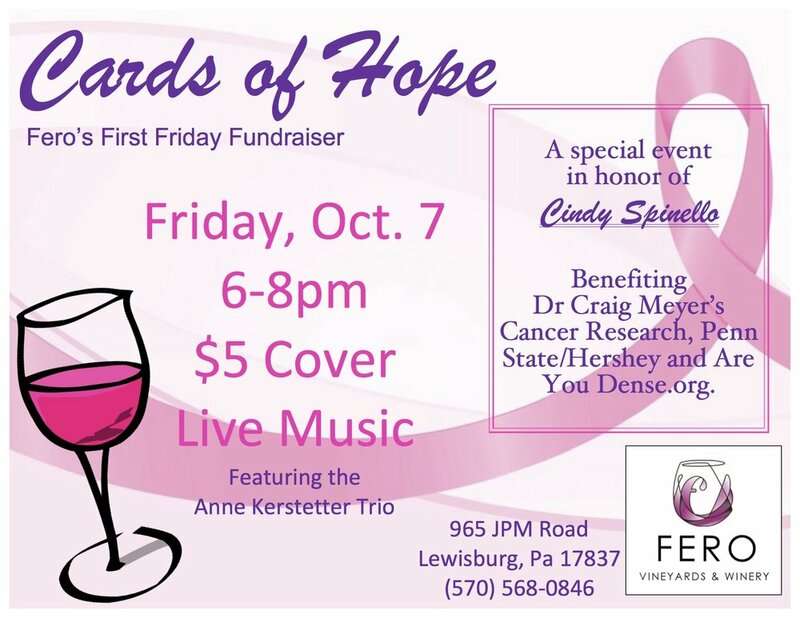 Ann Kerstetter Band will be playing music, and there will be a food truck as well! Eggs with prizes inside !! Join us at Fero for LIVE MUSIC by Wayward 1. Clint is welcoming Chris Moore, a very talented local musician as his partner in musical crime. Same powerful vocal with a more robust sound, complimented by a myriad of new music. Say “farewell” to summer at Fero’s Sixth Anniversary Party! This afternoon of family fun will be cohosted by the awesome people at West Branch Rental, and will feature music by Runaway Stroller. We want to thank the amazing community we’ve built at Fero by offering a day of games, inflatables, activities, and music that is totally free to the whole family! So bring your favorite people (and your thirst for great wine) and join us on August 12th for a day of fun! Come enjoy the Lewisburg Fireworks at Fero! We will be celebrating America with good wine, good friends, and Off the Record: Live Band Karaoke! Throw back to the good old days with Fero and Odyssey, as they bring back the 70's with songs by Creedence Clearwater Revival Band, The Rolling Stones, and of course, The Beatles! Join us on Friday, February 9 at 6:30 p.m. for our Food & Wine Pairing Dinner. Chef Hosch & Ann have put together a spectacular menu to pair perfectly with our award-winning wines! and can be ordered in-store or over the phone. Join us at Fero for LIVE MUSIC featuring Hearland Drive! Bring a picnic along to enjoy with your favorite Fero Wine or one of our PA Craft Beers! Join us in the pavilion for LIVE MUSIC and help raise money for Cards of Hope! Come and Meet the Winemaker! Stop by Fine Wine & Good Spirits store in Lewisburg and meet our winemaker, Chuck Zaleski! He'll be pouring our Gruner Veltliner and Estate Lemberger from 4-6 pm. More PA Wine Month Fun! Join us at Fero Vineyards & Winery as we welcome Frank Wicher to the pavilion. Join us at Fero Vineyards & Winery for an elegant evening of "who dunnit"
Set in the 1920's, Chuck and Daneen got to the vineyard just in time to find the vineyard hand dead in the new event pavilion! All of the staff have an alibi... or do they? Everyone one who works here is a suspect and no one knows where or with what the crime was committed. Can your table figure things out before the others? Chef Hosch is ready to fuel your minds with tasty food at this CLUE inspired murder mystery dinner. Enjoy the amazing view of the Lewisburg Fireworks at our vineyard on June 23rd! There will be tables and seating, but bring a blanket or lawn chair just in case! Live music featuring Sara Scott! Grab those Hawaiian shirts and say 'Aloha' to summer! Join the team at Fero and go cocoNUTS for Evangelical Cardiac Rehab! Yard games and drink specials ALL DAY! LIVE Music from 5 p.m. until 8 p.m. with the Ann Kerstetter Band!